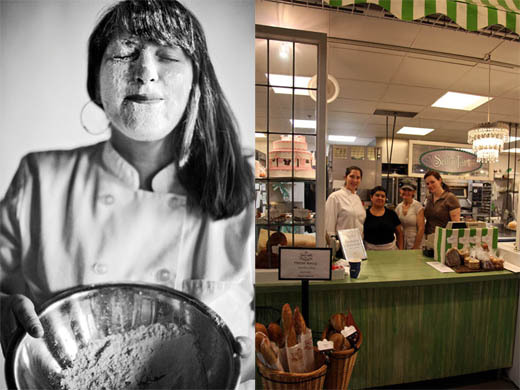 2/17/11 update: Michelle was just nominated for her 3rd James Beard Award!!!! So well deserved. Find more information from the Beard winning journalist Rick Nelson’s Star Tribune article. I met Michelle Gayer’s desserts many years before I ever met her. When I was still a pastry assistant I came to work with Charlie Trotter’s Desserts , which Michelle wrote while she was the pastry chef at Trotter’s, and convinced the team to make everything out of it. Her style was entirely about the food, elegant, but not architectural and overly fussy. I did manage to bake and cook my way through her book and probably landed the Executive Pastry Chef job as a result. Fast forward a decade and I was introduced to Michelle by a mutual friend. 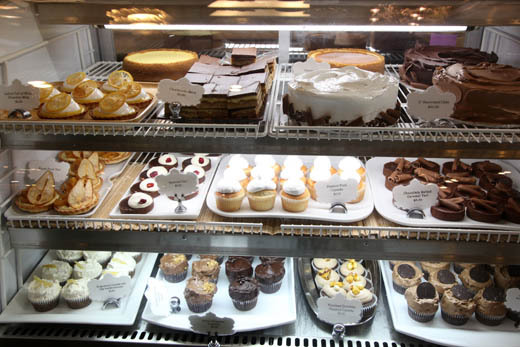 Michelle had just moved to Minneapolis from Chicago with her family to create the desserts for a national bakery. It was one of the finest days in our fair city’s history of sweets. We became fast friends, not in the kitchen, but on the playground with our kids. The very first day I met her we talked about her dream of opening her own bakery, which seemed as inevitable as snow in Minnesota. Just about 3 years ago she finally got the chance and opened the Salty Tart. It is an award winning treasure in the Global Market. 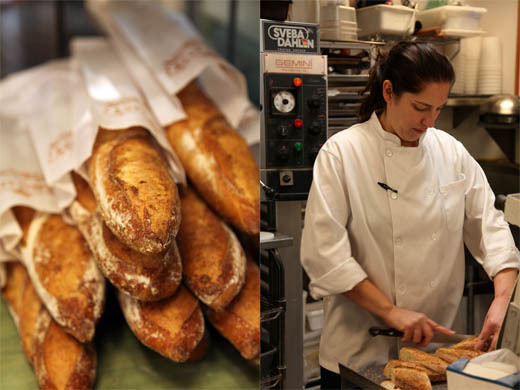 Filled with artisan breads (she uses a sour starter she got when she worked with Nancy Silverton), French pastries, to die for cookies and cupcakes. We did an event together last summer for a Farm to Table dinner at the Walker Art Museum and I got to work in her kitchen. Not only were her desserts lick-the-plate-clean-delicious and gorgeous, but her team at the bakery loved every second of being there with her. She opened her dream bakery and it is as wonderful and fun as she is. Michelle has generously shared her recipe (below) for this stunning Pear Galette, which is rustic and easy to make. She, of course, makes her own puff pastry at the Salty Tart, but you can create this dessert very quickly by using a store bought pastry. 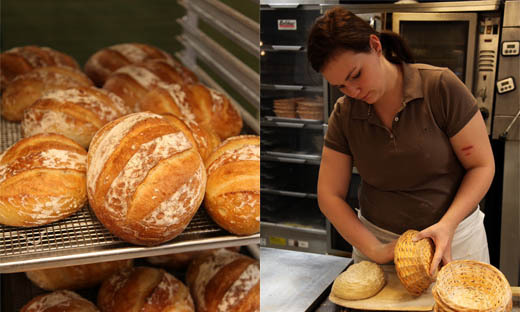 The Salty Tart bakes baguettes every day and also creates sandwiches to go. 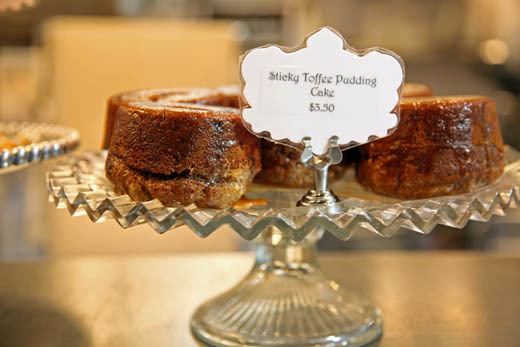 Sticky Toffee Pudding Cakes, which you know from last weeks post is one of my weaknesses. If you have a big party or wedding this is where you should come for your cakes, if you don’t make them yourself. 1 pound Pastry Flour – pastry flour is lower in protein (about 8%) than all-purpose, but higher than cake flour. Cut cold butter into small cubes. Mix the butter into the flours leaving butter in large chunks. Add salted water to flour/butter mixture and mix until the water is absorbed. Form dough into a flat square and let rest at least 15 minutes. Dust table with flour and roll out the dough into a rectangle. Give the dough a book-fold and let rest and least 30 minutes. Repeat rolling out, folding and resting until the dough has 3 book-folds. The dough is now ready to be rolled out and cut. In mixer with paddle attachment mix almond flour and sugar at low speed until evenly blended. Cut fruit in half (Pears, Apples, Nectarines work best) and remove seeds or pit. Roll out puff pastry and cut into circles that are about a half-inch larger on all sides than your fruit. Place a small scoop of almond cream in the center of the puff pastry circle and then place the fruit half, cut side up, on top of the almond cream. Egg wash the top of the exposed puff pastry dough, sprinkle with Demerara Sugar and bake approximately 20-30 minutes rotating halfway through baking until dough is golden and flakey. 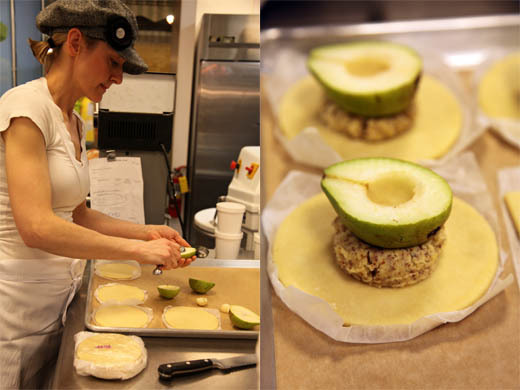 While I was at the bakery I overheard Michelle saying to one of her pastry assistance to bake it until there is color. “Color is flavor, so let it go until it is nice and caramelized!” I think those are great words to live by in the pastry kitchen and at home! Mortar & pestle, plus a signed copy of American Masala goes to Laurie. Dinner for 2 at Devi in NYC goes to Andy. gosh! These look simply divine! Is the butter in the almond cream softened or cold? Is 4 oz eggs correct and, if so, what is that in whole eggs? This sounds great and easy (since I plan on using store-bought pastry)! The butter should be at room temperature. An egg is approximately 2 ounces, so this recipe would use 2 eggs. This sounds like a wonderful recipe. I love fruit desserts and the combination of all those flavours with the rich butter pastry sounds divine. The combination within this dessert sound divine. Wonderful post. I always love reading about insider industry stories. These look amazing. What is the yield? It seems like the recipe makes a whole lot of little tarts, with the dough recipe making about 2 1/2 lbs. of puff pastry. That is the equivalent, I think, of two boxes of frozen puff pastry. That looks about right to me, you can wrap and freeze any leftovers. I love this, really want to make it. Thanks Zoe! This looks amazing! 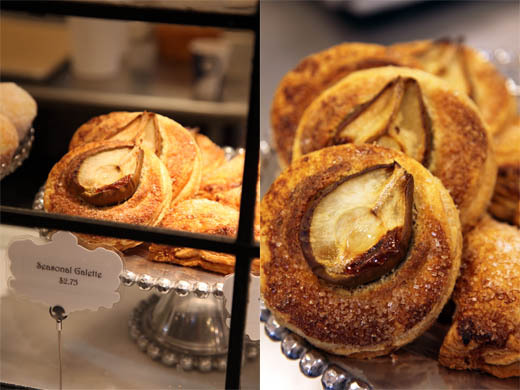 The Salty Tart is my favorite bakery in the Twin Cities. It will be one of my first stops when I return home this summer. Thanks! In the picture it looks like there was a sprinkling of sugar on the puff pastry. What do you think? Thanks for the recipe, I’ll be making it tonight! Yes, you are absolutely right, she sprinkled sugar all over the puff pastry and the pear. I *love* the Salty Tart. It is amazing. Thanks so much for this recipe! It’s amazing how that puff pastry raises so that it actually cloaks the pear. Do you think peaches or apricots would be too juicy to use? The Global Market is a remarkable place…wish I lived closer! I think stone fruits would be wonderful with this dessert! The ratio on the almond cream seems very different…. I am making these right now. . . and they aren’t nearly so brown as the ones in the picture. . . I’ve already let them go an extra 30 minutes in the oven and they just aren’t browning like the picture above (total an hour so far). Did I mess something up or are they really meant to cook that short a time? How long does she mean when she says, “until there is color?” I did snag a taste and they are yummy yummy, just not nearly brown enough. I am going to ask Michelle, but in the mean time I wonder if she baked them in a convection oven, which would be a more intense heat and brown them faster. Valentine Cookies and a Bright Red Scale!